After seeing this book, I knew I had to have it and thus I bought it immediately. And how happy I am that I did. This book was fantastic. I have always been interested in Roller Derby, it seems like an epic sport (though also painful) and thus I just had to try this book out. 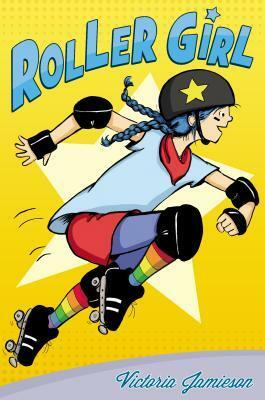 A book about a girl who is finding herself, and finding a place in Roller Derby. The main character was pretty great, though at times I was just shaking my head. She apparently expected the Roller Derby to be an easy task, something that anyone can do, and she quickly finds out that this is not true and everything is tough. That you just don’t go from nothing to epicness without a fight. I didn’t particularly like how she acted so often in the training. Crying, whining, being a brat about things. She should be grateful that they still want her, that they want her in the competition. Instead she fights with a new friend, acts like a brat and trains too much. But, even with all this, I can imagine why she also was like this. After all the drama with her best friend, and a mean girl who is back in the picture. And then add to that the puberty and growing up stuff, I can imagine why she was like this. However, that still doesn’t excuse her. It still doesn’t make it all right. But she was also really interesting and it was quite realistic to see her change. From not knowing what to do, to be unsure about herself, to rising up and coming out a stronger version of herself. I loved our main character’s new friend. She was terrific and I loved how she dyed her hair, and also helped our main character to look more tougher and to avoid the mom flipping too much (I adored that part). She was a really good friend, supporting her and trying to be there for her. Cheering her up. I felt sorry for her when all the drama happened. It was quite clear to everyone that she didn’t want that role, but that she got it assigned and that there was nothing to do then to just go along with it. It wasn’t as if she desperately wanted it. I also have to give a big applause to the main character’s mom. Who was wonderful, who tried her best to care for her daughter, to be there for her. And she gave her some great advice when everything went wrong. Seriously, she is one super mom! The art is really great and I loved how everything was drawn. I also loved how vivid the colours were that the artist used. One thing that I would love to have? A sequel. About Astrid’s time in Junior High, how the Derby is going and how her friendships are going. All in all, I would highly recommend this book to everyone!